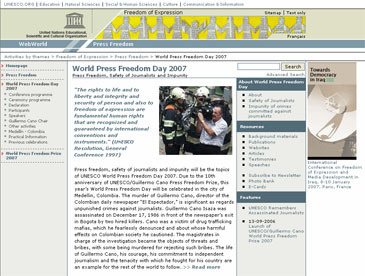 UNESCO launches a website dedicated to the World Press Freedom Day to be celebrated in Medellin, Colombia on 3 May. The website provides regular news services, practical information, more detail on the conference, speakers and participants. This year’s event consists of a two-day conference on the theme "Press Freedom, Safety of Journalists and Impunity" and the award of the UNESCO/Guillermo Cano World Press Freedom Prize 2007. This year we celebrate the 10th anniversary of the UNESCO/Guillermo Cano Press Freedom Prize. The choice of Guillermo Cano’s homeland for this year’s ceremony is particularly appropriate considering the themes of journalist safety and impunity. Guillermo Cano Isaza was assassinated on December 17, 1986 in Bogota for his fearless denouncement of drug trafficking mafias. The fact that his murderers have not been brought to justice is an unfortunate reflection of today’s reality. Around 150 participants, representing media institutions, NGOs, government, universities and other organizations are expected to attend this event. Media specialists and participants will discuss the strong link between press freedom and the safety of journalists during the two-day conference on 3-4 May 2007. On the recommendation of an independent jury, the World Press Freedom Prize will be awarded to this year’s chosen laureate at the ceremony on 3 May 2007.